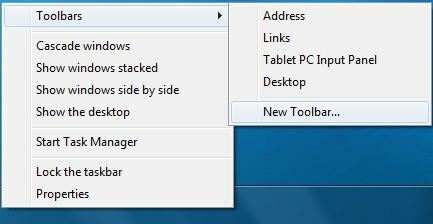 Quick Launch Bar has been almost deprecated in Windows 7 as the whole Taskbar been replaced with greatly enhanced Superbar, which now allows shortcut icons to be placed on it directly. For users who miss Quick Launch bar so much to want it back in Windows 7, Microsoft has not yet completely removed the Quick Launch Bar yet, instead the Quick Launch Toolbar has been disabled and hidden by default. To move the Quick Launch Toolbar to the left of Taskbar next to Start button, unpin all application programs from the Superbar by right click on each and every icons, then select Unpin this program from taskbar. 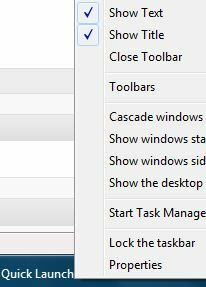 Move the both borders of Quick Launch Toolbar to the furthest left, and then re-pin the applications to Taskbar if you still require them. 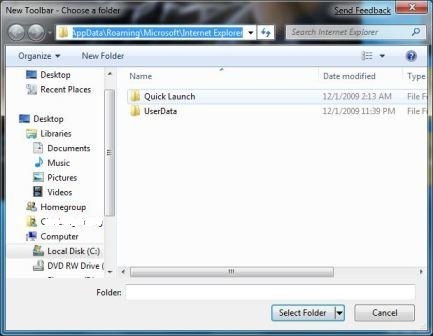 Add the icons and/or shortcuts to Quick Launch Bar by drag and drop to the Quick Launch Bar Toolbar or to %SystemDrive%\Users\%username%\AppData\Roaming\Microsoft\Internet Explorer\Quick Launch\ folder, while delete the icon as you would with any typical file (right click on it, and then select Delete).